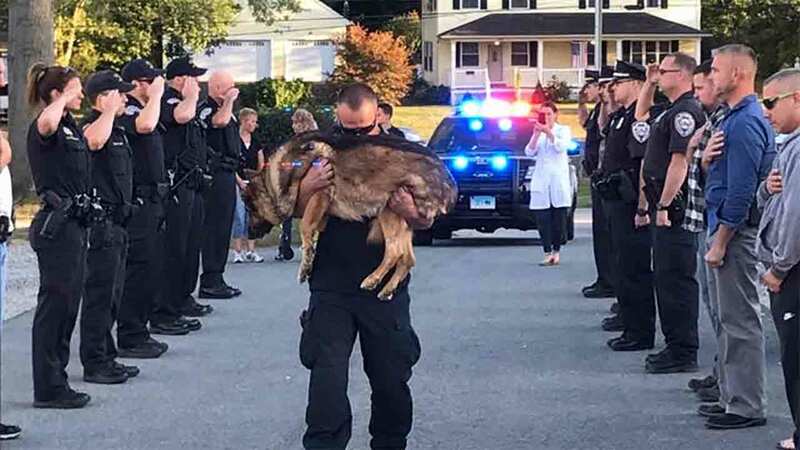 MIDDLETOWN, Connecticut -- An emotional photo of a Connecticut police department saying goodbye to a K9 officer is pulling on hearts across the country. Officer Michael D'Aresta's K9 partner, Hunter, had been ill for the past several days. Tests revealed that Hunter had an aggressive form of liver cancer, and the veterinarian's recommendation was that he be euthanized. So Friday afternoon, officers with the Middletown Police Department lined up to pay their respects to Hunter, and offer support to his handler, Officer D'Aresta, as he carried Hunter into the veterinarian's office to be put down. As his brothers and sisters in blue saluted his partner, Officer D'Aresta held Hunter close. A photograph of that embrace was posted to the Middletown Police Department's Facebook page. The caption accompanying the post reads: "Hunter and Officer D'Aresta have been such a huge part of our department the past ten years. Such a dedicated K-9 team. It will never be the same. Rest in Peace Hunter you've done well. Our thoughts and prayers go out to Officer Michael D'Aresta and his family."